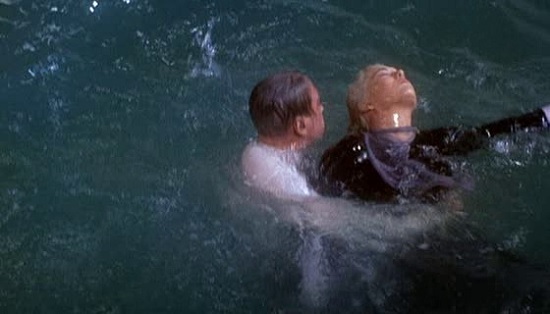 Alfred Hitchcock's "Vertigo" produces a narcotizing effect, a lulling, dream-like ambiance that is hard to shake off once seen. Vertigo may be Alfred Hitchcock's best film and probably his richest — the one that keeps calling us back for further analysis, the one hardest to release from our minds after the end credits roll. The story, adapted from the French novel D'Entre Les Morts (From Among the Dead), is certainly one of cinema's most compelling, as famous for its magnificent construction as its actual entertainment value. A rich masterpiece of macabre obsession, Vertigo is not so much a movie as a web that entangles and ensnares both the characters and audience. Gavin: "I'm afraid some harm may come to her." 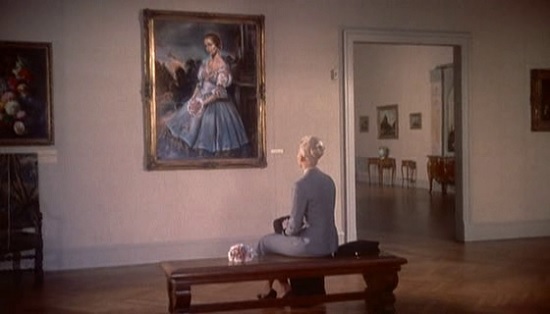 Elster suspects that Madeleine (Kim Novak) may be possessed by the spirit of her great-grandmother, Carlotta. Madeleine frequently slips into strange trances, during which she seems to become another person; when she awakens, she's unaware that anything peculiar has happened. While entranced, Madeleine often goes to a local art gallery and stares for hours at a painting of Carlotta, and she has begun collecting possessions that once belonged to her dead relative as well. Scottie suggests Madeleine may simply be smitten with her family history, but it appears to be more complicated: the "real" Madeleine denies ever having heard of her great-grandmother. But these transformations are becoming increasingly frequent, and Elster fears for his wife's life: Carlotta committed suicide when she was 26 years old — Madeleine's present age. As a favor to his friend, Scottie agrees to keep an eye on her, hoping to unearth some clues about her condition along the way. This setup implies a conventional (if fascinating) thriller, but don't be fooled: the above synopsis barely scratches the film's surface. Vertigo is much more than a tale of the supernatural: it's a story of passion and intrigue, obsession and objectification. When Madeleine commits suicide 90 minutes into the film (trust me, I'm not giving anything away by telling you this), Scottie becomes almost comatose with grief — he's haunted by images of Madeleine everywhere he looks: one woman has the same hairstyle, another same outfit, another same smile. It's not until he meets Judy Barton (Novak, in a dual role) that Scottie comes alive again. The brunette Judy bears an amazing resemblance to the blond Madeleine, but it's not enough: Scottie insists on shaping her into an exact replica. His attempts to re-create the dead Madeline eventually destroy the relationship — but not in the way you'd think. 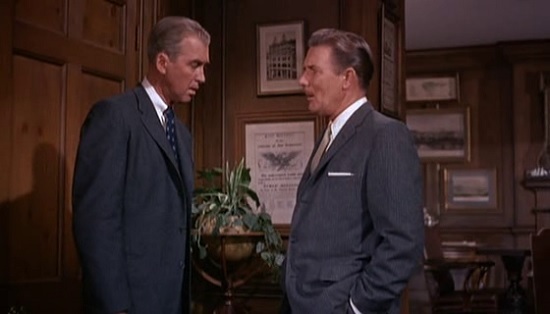 While much of Hitchcock's work revolves around obsession, Vertigo is the only film that's actually about it. Scottie sees Judy not merely as a substitute for his lost Madeleine, but as a penance: he reasons that if he can make Judy into Madeleine, he can protect her, thereby ending his feelings of guilt over her death. But Scottie doesn't really care about Judy — she could be anyone, as long as she's willing to be sculpted into the vision carried in his memory. 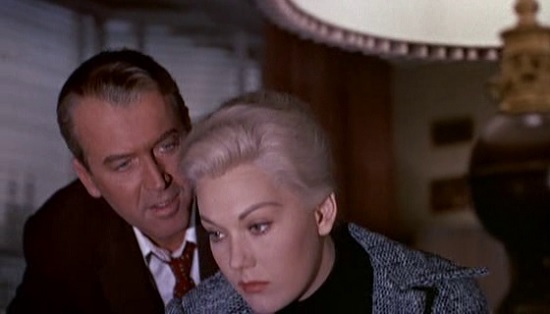 The pace of Vertigo is deliberate and methodical; indeed, the second-billed Kim Novak doesn't speak her first line of dialogue until 46 minutes into the story. 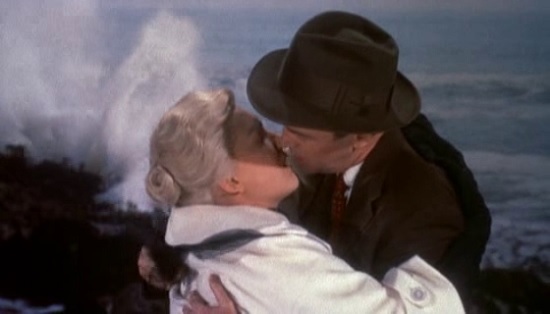 It could even be argued that the first two-thirds of Vertigo is little more than an extended prologue for Scottie and Judy's relationship, which occupies a scant 38 minutes of screen time. However, the tempo never drags, thanks to Hitch's technical genius and tremendous performances. Very few directors know how to use the camera as well as Hitchcock did, and the lens in Vertigo becomes part of the story. The photography is as distant and aloof as Scottie's own feelings for Judy: medium and long shots are the norm, with close-ups rarely used to emphasize people. Conversely, Hitchcock often employs tight close-ups to heighten the importance of inanimate objects (the zoom-in on Madeleine's necklace, for example). By using this technique consistently throughout the film, Hitchcock strikes a disquieting, off-balance note from the first frame of the story, which adds immeasurably (albeit subtly) to the noir atmosphere. Judy: "If I let you change me, will that do it? If I do what you tell me, will you love me?" ...and she's forever lost in darkness. It's a chilling concept, and Hitchcock pulls it off brilliantly, making us feel the pain of both Judy and Scottie. Technically the film is magnificent, the opening credits from Saul Bass brilliantly prepares us for what is about to unfold, while Bernard Herrman's score as good as anything he ever did, unnerving one minute, swirlingly romantic the next, a truly incredible score indeed. Hitchcock himself is firing from the top draw, introducing us to the brilliant zoom-forward-track-back camera technique to induce the feeling of Vertigo itself, with that merely a component of two hours of gorgeous texture lined with disturbing little peccadilloes. The two leads are arguably doing their respective career best work, James Stewart as Scottie Ferguson goes real deep to play it out with an edgy believability that decries his aw-shucks trademark of years since past. Kim Novak as Madeline is perhaps the quintessential Hitchcock blonde, perfect with the duality aspects of the role and playing off Stewart's ever creepy descent with seamlessly adroit skill. It however should be noted that Hitchcock and his loyal subjects had to work hard to get Novak right for the role, but the result proves that Novak had ability that sadly wasn't harnessed on too many other occasions. 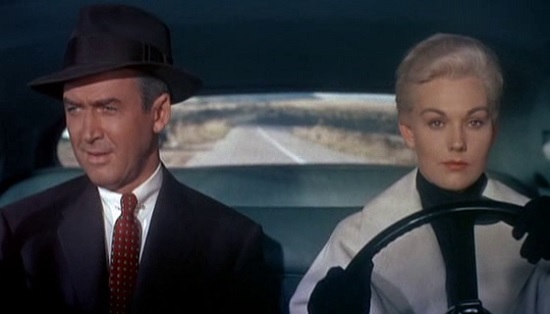 Vertigo is a great example for what color films really can look like! Not only do I want to praise the quality of the Technicolor dye transfer prints but also more the way Hitchcock used color to create moods. 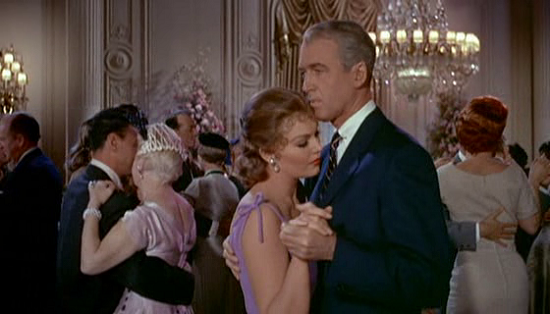 Vertigo is full of scenes where the colors have been saturated or changed to create a special feeling. Hitchcock even went so far as to openly dye some frames is bright unnatural colors. He played around with colors in all his color films but never as much as in this one. 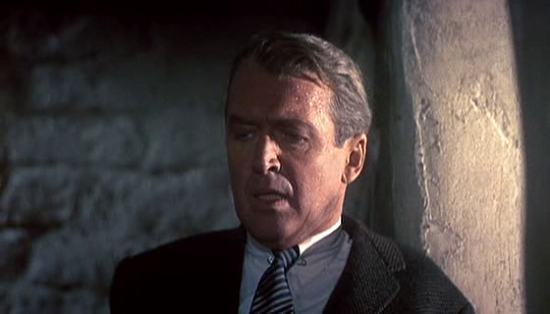 Think for example on James Stewart's nightmare in the middle of the film. There are frames dyed purple and green; the cemetery scenes are red, inserted to the rhythm of the music with normal frames. 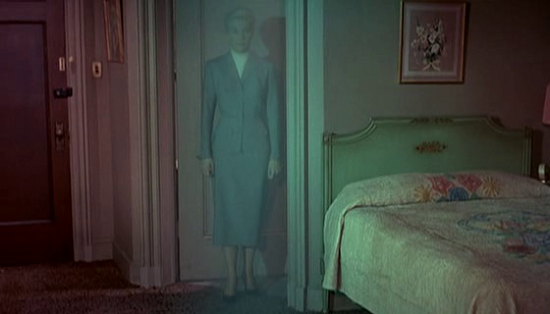 Kim Novak is often bathed in colored light like in the famous hotel room scene, where she appears like a ghost with all the green light around her. The shading is also important. In the scene in the bookshop we hear a dark and sad story while at the same time the light dimes down to simulate dusk. In the scene where Judy remembers the real events in the bell tower it starts with an outdoor scene, which we have already seen but it is now much darker than the first time. In the sequence where Stewart follows Novak to the cemetery everything feels unnatural since every scene glows through the use of a filter that creates a blur. 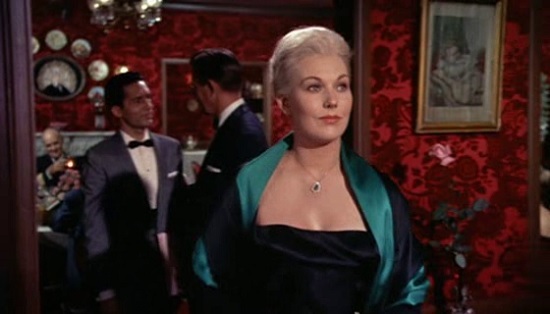 The non-color of Kim Novak's dress as Madeleine is also a very important aspect in the film. She has to color her hair to become Madeleine again at the end of the picture. And there's so much more to Vertigo than just these details . The more you watch it, the more you realize that the film is a like cinematic onion; with each screening, another layer is peeled away. But rest assured, you're still a long way from the center, leading us to a spine tingling finale that is as hauntingly memorable as it is shocking, the end to our own dizzying journey that Alfred and his team have taken us on. Vertigo is simply a film that demands to be seen as many times as possible to understand its subtle nuances and astonishing virtuosity . So invest your soul in it, just the way that Hitchcock himself so clearly did.